Once you're ready for a weight machine, be prepared to spend some serious cash. You can enjoy all the benefits of gym membership - a wide variety of equipment and facilities, good advice from staff and other members and the incentive to work out by making the gym a destination. But, you can also enjoy having the ease of access and the absence of a commute by purchasing home gym equipment. If you're just getting into, or back into, a fitness routine, you should hold off purchasing anything. Using relatively new professional equipment, under the guidance of a knowledgeable instructor, will give you a good basis for comparison when shopping. One of the first pieces of equipment anyone interested in weight training will want is, naturally, a set of weights. 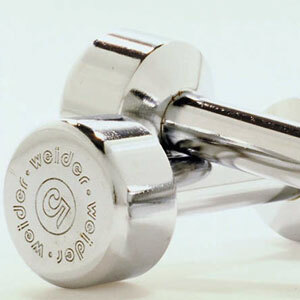 Free weights can be purchased for very little money - a basic set is often under $50. You'll want a mixture of small, 10 lb (4.5 kg) and 20 lb (9 kg) hand-held dumbbells and a bar with larger, exchangeable weights. Just about any bar is as good as another, but weights can be either metal or plastic. Some people like the old-fashioned clink of metal, but plastic weights (usually composite or sand-filled) are marginally safer. At some point, you'll want to 'graduate' to a weight machine. They offer the ability to focus on specific muscle groups - biceps, quadriceps, deltoids and others - in a much safer way than free weights can. Also, some muscle groups - calves or hamstrings, for example - are harder to work using free weights. Once you're ready for a weight machine, be prepared to spend some serious cash. Costs and configurations vary. Some are just simple resistance machines, essentially composite rubber stretching straps that allow for some adjustment to the tension. These run a few hundred dollars. Others are multi-station, adjustable weight stacks, often costing from $1,800 to $5,000 or more. Stair steppers are becoming increasingly popular. A very simple model can run anywhere from $80-$150. It offers you the ability to get a good cardiovascular workout in a small space at home with low joint impact, while you build thighs and calves. Beware anything that looks like too good a deal, though. Reliability is key here, otherwise you've spent $100 for nothing when it breaks two months after purchase. Some stair steppers run as high as $1,700 or more. At this level you should be getting a lot more than just the ability to simulate walking up stairs. Apart from reliability and handrails, which should be rock solid for 5 years or more, you should be able to adjust resistance level, speed, angle, and distance between the pedals. You should also get a heart rate monitor and other digital readouts (speed, distance climbed, calories burned, etc) as part of the package. Treadmills, too, are becoming a more common part of the home gym. Since they run anywhere from a few hundred dollars to $2,000 or more, you should expect to get a lot for your money. Again, they should be completely smooth working, stable and reliable for several years. A good treadmill should have a great, non-slip surface and it should be able to go faster and offer more resistance than you could ever use as you build up. Like stair steppers, it should come with an impressive panel of controls and digital gauges. Any treadmill that costs over $1,000 should have, at minimum, adjustments for and measurements of speed and distance 'walked'. It should include calories burned, with tailoring based on age, weight, etc. A heart rate monitor is a great plus. Of course, if you plan to spend several thousand dollars to acquire home gym equipment, you should be prepared to dedicate yourself to a consistent, regular workout. But that's something no manufacturer can guarantee.